W.O.O. Revelator / Ernesto Diaz-Infante & Pat Harmon Duo - "The First Time"
While touring California last year, New York's finest avant-jazz freakout trio hooked up with pianist/guitarist Ernesto Diaz-Infante and bassist Pat Harman for a little improvisational muscle-flexing. The 9 tracks on The First Time include various combinations of the five musicians and two tracks with all of them. The result is a set of free-jazz and noise workouts that, while far lower in volume than typically heard from W.O.O., are no less adventurous and enjoyable. "Merger" and "Urban Slip" are the tracks with all five musicians. "Merger" is a quiet but busy avant jazz exploration with guitars, piano, drums, flute, sax, and freaky electronics for embellishment. At one point Ernesto gets quite possessed on the piano and duels with drummer Ray Sage while Bonnie Kane plays slow wailing sax lines. Sage has become one of my favorite drummers and hearing him and Ernesto duking it out is a joy. For "Urban Slip", Bonnie kicks out cool smokey lounge flute lines while Ernesto tickles some mean ivories. Sage, of course, is right up front jamming on the kit and Chris Forsyth adds fire to the mix with his rapid-fire guitar licks. I don't know if it's guitar or electronics but there's also some trippy spacey sounds adding a welcome bit of color to the proceedings. "Whispy Streaks" and "Sweeping Edge" are the tracks featuring the W.O.O. Revelator trio. "Whispy Streaks" is a cool free-jazz workout with nice flowing flute and tribal percussion. I love the abrupt shifts between the softer moments and the chaotic guitar/drums freakouts. If there's a trademark W.O.O. Revelator sound then Sweeping Edge" represents it quite nicely. Sax, guitar, and drums all jamming away in their individual spheres, yet coming together in a whole that is chaotic yet tight. "Elephant Valley" and "Delta Itch" feature the Ernesto/Pat Harman duo. Ernesto is an IMPRESSIVE pianist playing killer avant-jazz runs that don't sit still for a moment. I'm new to Pat Harmon's music but much of the bass playing on "Elephant Valley" sounds like guitar. It doesn't become apparent as a bass until later in the track. An interesting duo piece. On "Delta Itch" Ernesto switches to prepared acoustic guitar and blazes away in experimental fashion while Harmon creates droning atmospherics on the bass. Quite an intriguing contrast and another fine duo track. Rounding out the set is "Jamble Walk", which is a duo piece with Ray Sage and Pat Harman. "Kabuki Swell" is a flute/sax and prepared guitar duo with Bonnie and Ernesto. And "The Later Zone" is a Forsyth/Ernesto guitar duo. Ernesto and Chris Forsyth have released an entire CD of their duo guitar improvs but this is my introduction to their work together. Very much along the lines of Derek Bailey, Fred Frith, and Henry Kaiser's most extreme works, I really enjoyed the acoustic/electric guitar combo, with Forsyth's guitar playing cool wah'd licks that add a psychedelic element to the avant-garde. In summary, as these are all improvisational musicians operating in similar realms, bringing them together was just about guaranteed to produce exciting results. W.O.O. 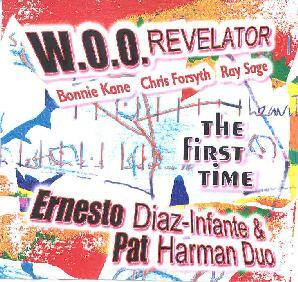 fans should check this out as an introduction to Ernesto and Pat Harman, and, likewise, Ernesto fans should consider this a good introduction to the W.O.O. world. For more information you can visit W.O.O. Revelator at their web site. You can visit Ernesto Diaz-Infante at his web site.